Disclaimer - By reading or following this tutorial you agree that this tutorial is for educational purposes only. 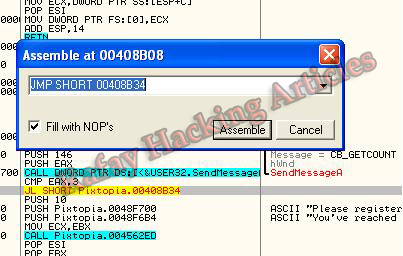 1.First of all download Pixtopian book and install in to your computer and open the Pixtopian book. "You,ve reached the limit of three groups. Please Register Pixtopian book today!" You,ve reached the limit of 4 enteries per group/ Please register PixtopianBook today! 7.Now change the value of JL SHORT 00408B34 to JMP SHORT 00408B34 and click assemble and click the blue button at the top. 8.After you click play you will end up in the following line 760642EP , The program will still not run because it has a very little range. 9.Now to increase range we will go to Options - Debugging options - Exceptions and there click on "add range of exceptions" and enter the range to "000000" and in the form "Last exceptions in range" we will enter "CCCCCCCC" Click Ok and tick also "Ignore also the following custom exceptions and ranges"
10.Now restart the program and follow again follow the steps 1-5 and again change JL SHORT 00408B34 to JMP SHORT 00408B34 start the Program and it will work and it will work for you and you can add more then 4 Groups and for adding more names repeat the above steps again. 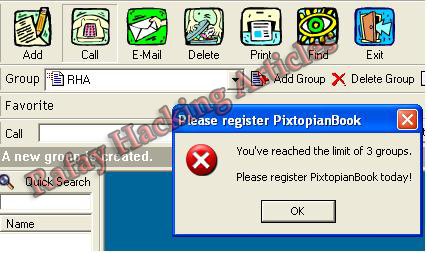 Hint:Search For the error "You,ve reached the limit of 4 enteries per group/ Please register PixtopianBook today!" blackhatmailer.com is related to a few other domains that connect to the same ip..
that seems to be removed for good. Thank you for contacting Download.com. This product is no longer available, so, we have removed it from our catalogue. Please, let me know if you have additional questions or concerns. secondary vain site code verification that disables all functions. responsibility & remove that stupid verification.